Hachette Partworks has a new partwork launch in the Adult Colouring area launching this week. "…help you restore your inner calm…"
Since Hachette Partworks launched Art Therapy in March 2015, say distributors Marketforce, the sector has driven over £12 million of revenue into the UK Newsstand, and this launch is expected to provide another large boost to the sector. Description: “Full of stunning patterns to colour and collect, this brand new adult colouring book collection will help you restore your inner calm as you build up a wealth of gorgeous designs. 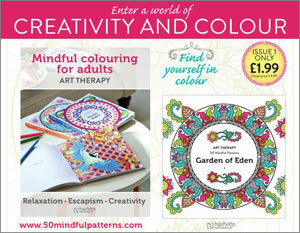 Each high-quality book has its own inspirational theme and includes 50 stunning patterns to colour, plus mindfulness quotes and ideas to help you relax and unwind. TV Advertising: TV Ad campaign starts 11th October.